Hong Kong’s Chief Executive, Mrs Carrie Lam delivered her first Policy Address since assuming office on 1 July 2017. In the Policy Address, themed “We Connect for Hope and Happiness”, the Government, adopting new thinking and a new role, explained the philosophy of governance for various policies and put forward innovative measures with new perspectives to solve economic and livelihood issues of public concern. Mrs Lam outlined her strategies to promote economic development, enhance people’s livelihoods and foster a more inclusive and harmonious society under “one country, two systems”. She identified good governance as a top priority for her political team, saying that it is vital, whether in discharging the responsibilities of the Government as a ‘service provider’ or a ‘regulator’ but also as a ‘facilitator’ and a ‘promoter’. She added that the Government will take concrete actions to resolve problems for the people, following the principles of being “Innovative, Interactive and Collaborative”. * HK$1 billion to the CreateSmart Initiative to develop design and creative industries. Mrs Lam said that Hong Kong would capitalise on the opportunities presented by the Belt and Road Initiative and the Guangdong-Hong Kong-Macao Bay Area development. 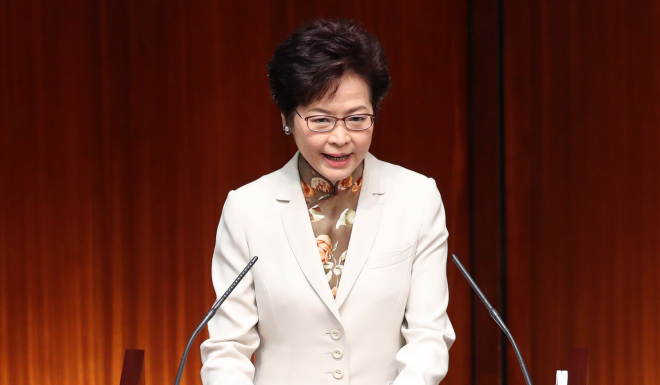 She said the Government hopes to forge a comprehensive agreement with the National Development and Reform Commission by the end of this year, regarding Hong Kong’s participation in Belt and Road projects. The Government has set a goal to double the Gross Domestic Expenditure on R&D as a percentage of the Gross Domestic Product to about HK$45 billion a year (i.e. from 0.73 per cent to 1.5 per cent) by the end of the current Government’s five-year term of office. Mrs Lam also emphasised the need to diversify Hong Kong industries, in which innovation and technology (I&T) has competitive advantages and development potential. She will personally chair an internal Steering Committee on Innovation and Technology to take forward the development of I&T in Hong Kong, and to steer collaboration and participation across bureaux and departments with effect from the most senior level. She will also ensure that the resources requirement will be met in a timely manner. To improve the liveability of Hong Kong, Mrs Lam identified various initiatives, including launching Operation Building Bright 2.0 with funding of around HK$3 billion to subsidise residents in maintaining their buildings, and earmarking about HK$2 billion to subsidise eligible owners of old composite buildings to adopt fire safety enhancement measures. Mrs Lam also announced the setting up of a Countryside Conservation Office to co-ordinate conservation projects that promote sustainable development of remote countryside areas. She added that HK$1 billion has been set aside to take forward relevant conservation efforts and revitalisation works.